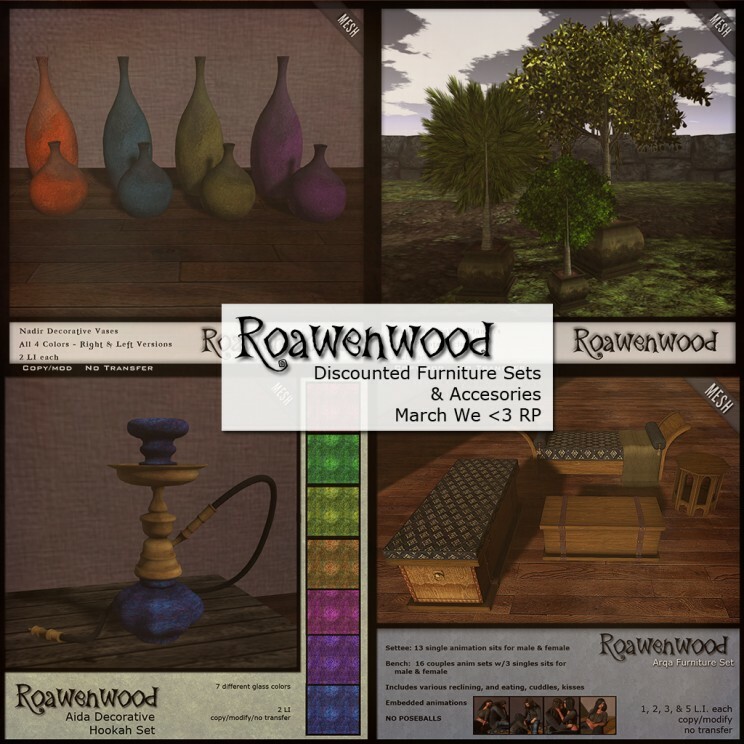 This month I decided to release a warm and spicy Moroccan flavored set for We <3 RP. The new items is the couples bench, though the accompanying items have not been released in the store they have been seen a little bit before this event on occasion floating around. The woods are warm, the upholstery rich. Each piece complimenting the other to create a well rounded scene if you’re interested. From plants, to vases… a couples bench and a settee for reclining. The couples bench has a fairly awesome set of cuddles, kisses and snuggly things along with a few singles sits. The settee is really meant for one, to recline, snack and enjoy a few moments. Tables are also included for decor and a hookah with texture change for the glass so you can have different colors. All at a 30% discount for the month each piece is worth taking a peek at. Have fun and happy shopping! !